Okay so you have brought your new toothbrush and just taken it out of its packet and have used it for the first time. But where do you put it after brushing with it? Do you leave it on the counter or store it in a small cabinet? Either way, bacteria are going to attach on to the bristles fast and then you are back to square one. Most of these bacteria are harmless but there are a few that might cause you oral health problems. In some studies, the bathroom counter had way more bacteria than the toilet rim, Imagine That!. It’s really important you keep the bristles on the toothbrush as sterile as possible and the only real way of doing this is by having a UV Toothbrush Sanitizer Holder. And in this post we are going to review one that is really popular but also cheap. This is a sleek looking toothbrush holder which holds up to 5 toothbrushes at one time. Electric or manual, it can handle both. 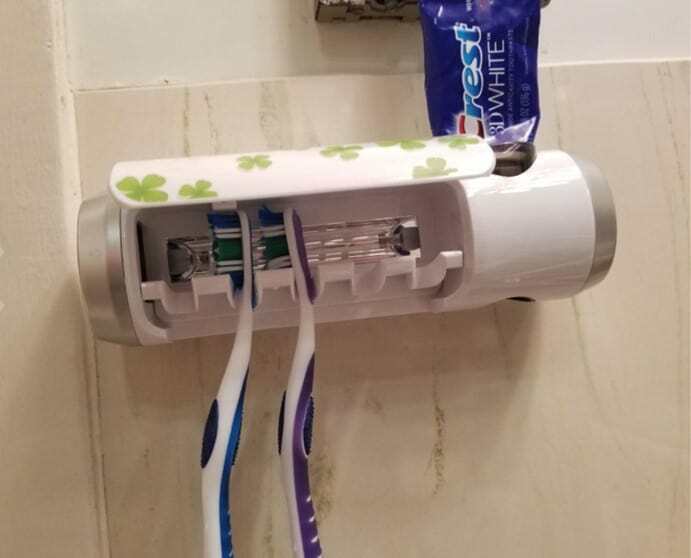 It mounts on to the wall and even has a designated space to store the toothpaste. What really differentiates this from other sterilizers is the built in fan. This helps to dry out the toothbrushes first so no moisture is left. Once this step has been carried out. It will then move onto the sterilization which is basically a UV light that is directed right onto the bristles to eliminate the bacteria present on them. It’s one of the more popular sanitizers on the market and is quite popular, just check out the reviews people have left over at Amazon. How Does UV Kill Bacteria? Bacteria are a group of single-celled microorganisms that reproduce through cell division. The light destroys the bonds of nucleic acids (small biomolecules essential to all forms of life) that make up DNA. It is this disruption or damage to the DNA that affects the cell division and means they cannot reproduce and perform the functions they need to, therefore stopping the growth of bacteria. It’s actually more complicated than this but this is sort of the main outline in laymen’s term. It has a Built In Fan which is not seen in other toothbrush sanitizers and this is really useful because it gets rid of the moisture from the brush before blasting it with UV rays. Removing moisture is important because bacteria love these sorts of conditions, In fact they can multiply much faster in humid conditions. Multifunction design – Couple of years ago you would see toothbrush sanitizers that were only designed for 1 toothbrush which meant that each member of the family had to buy separate ones. But the Sarmocare is different because it offers you 5 different slots to put toothbrushes in. It also has space to put your toothpaste in which is great. 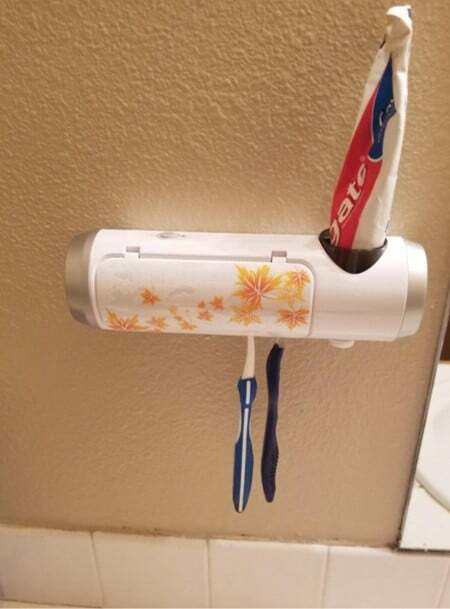 The only minor thing is that some other toothbrush holders have a toothpaste slot where you can actually slot the paste in and it will automatically come out when you push the brush head against it. Not a huge deal breaker but maybe something to think about if they decide to upgrade? You will be glad to know that no drilling or hammering is required to fix this toothbrush holder onto the wall. All it takes is some strong 3M double-sided scotch tape. The first step is to take the anchor piece and put the tape on the back of it before attaching to the wall. We recommend you place it somewhere close to a power socket because it needs a USB charging port. It will just make it a lot easier in the long term. The Second step is to make sure the anchor is sturdy on the wall. Put slight weight on it using your hand and if it doesn’t move then you can go ahead and place the unit onto it. A thing to note is that some people have said the unit comes off the anchor sometimes which is slightly annoying but you can put it back on easily, so it’s not a big deal. Once you have it set up you can plug it in and it will be ready to use. Place the toothbrushes, bristle side facing the metal bit inside the unit and close the cover. Then press the on button and it will start making a slight humming sound which is the fan working. After about 4-5 minutes it will stop making the noise which means it’s ready to start killing the bugs. The blue UV light will come on for about 8 minutes and will turn off automatically once it’s done. It’s pretty simple to use and after a while it will become second nature to you. Even with it’s slight flaws, this UV Toothbrush Sanitizer Holder is much better than leaving your brush lying around on the dirty counter top or in a draw! Sanitization through UV is great because it does not involve any chemicals whatsoever which gives you that peace of mind that kids are going to be safe and will not accidentally ingest something they are not suppose to. 5 Holders – Some other basic models only have enough room for 1 toothbrush to fit but the Sarmocare is better because it allows the whole family to share the sterilizer. This saves you money and hassle! Holds Charge Well – Many customers have said that they only charge the unit once a week and then it’s good to go for a whole 7 days which is terrific. However, some people like to keep the unit plugged in at the mains so it’s running all the time and you don’t have to worry about it going dead. 1 Year Warranty – Great customer service and if anything goes wrong with the UV toothbrush sanitizer they will replace it for you free of charge. There was only a couple of instances where the unit broke down withing 2-3 months but it’s quite a rare occurrence. 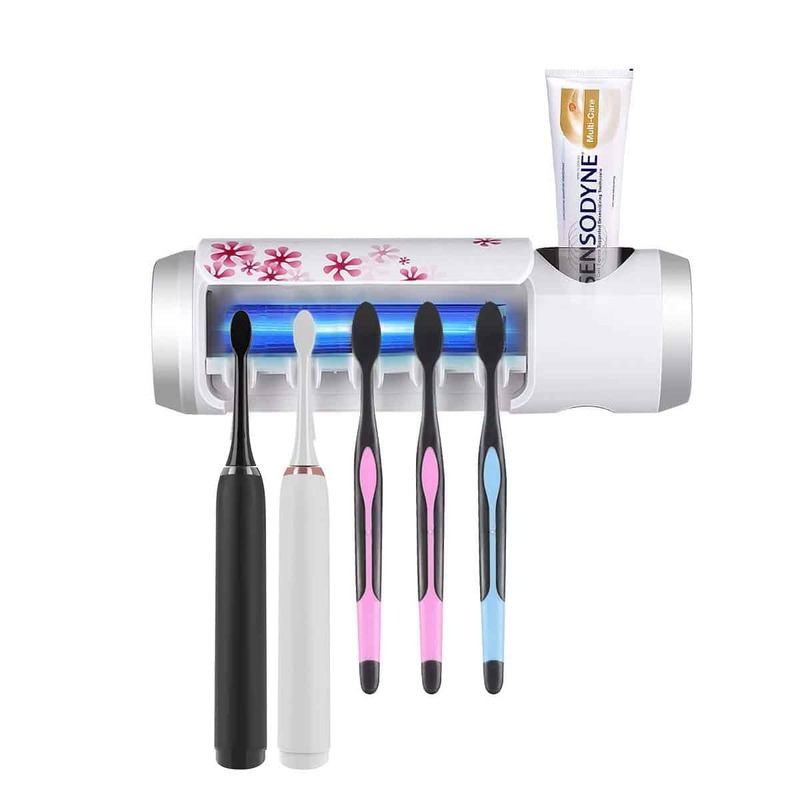 Not A Toothpaste Dispenser – Some other brands like the Meco UV toothbrush holder have a slot where you can fit the toothpaste in and press a button and it will come out automatically. Unfortunately the Sarmocare does not have this feature which is a shame because it would make it the best on the market. Oral B Toothbrushes Won’t Fit – Manual toothbrushes fit without a breeze but some of the more prominent electric brushes do not go all the way in which means the door will not fully close. It’s not too much of a problem because it will still work but it’s slightly annoying. What Do Customers Think Of This UV Toothbrush Sanitizer Holder? The majority of people who brought it loved it. It has over 120 Reviews on Amazon with an average rating of 3.9 out of 5 Stars making it a solid product to own. What people loved about this unit is how versatile it is. There is enough space to hold 5 toothbrushes which is enough for a medium-sized family and the toothpaste holder is a plus. It makes the whole thing nice and tidy looking. Another thing was the ease with which they fitted the unit onto the wall. No hammering or nails were required as it comes with a strong adhesive tape which does an excellent job. However there were a handful of negative reviews left by customers which was mainly due to the malfunction of the unit. Some people noticed it stopped working after a month as the bulb was broken whilst others noticed it was losing charge really fast. But this was a rare occurrence and for the most part, people enjoy using it and has made their toothbrushes 100% more sanitary. Sarmocare is an independent company which solely uses Amazon to ship its products. So if you want the genuine product this is the place to buy it. It costs $28.99 which is highly respectable considering it’s got both a built in fan and a UV light. You are getting a lot of value for your money! And don’t forget you also get a 30-day money back guarantee as standard alongside the 1-year warranty by the manufacturer. If anything goes wrong you will be covered. Invest in a UV Toothbrush Sanitizer today and Keep your Toothbrush clean forever. Just head over to Amazon and make your purchase Now. There you have it folks, we have given you the full review of the Sarmocare UV Toothbrush Sanitizer Holder and hopefully now you understand it in better detail. It only costs $28.99 which is amazing considering it has a built in fan and a specialized UV light. The 5 toothbrush holder slots make it ideal for a small to medium-sized family and comes with a toothpaste holder too. The majority of customer reviews are also positive. There were some negative reviews regarding the malfunctioning of the product but this was quite rare and there isn’t too much to worry about because you get a 1-year warranty with it. All in all, it’s a good solid product that gets the job done pretty efficiently and will stop your toothbrush from ever getting dirty again! Q. What if the UV light gets busted, can I get a replacement bulb? Q. Does it turn off automatically when sterilization is complete? A. Yes, it turns off by itself. Fan runs for 4 minutes to dry the toothbrush, then UV light for 8 minutes to kill microbes, then shuts itself off. Q. Does the unit have a battery or will need to be plugged in all the time? A. It has a rechargeable battery which only requires charging once per week to keep it fully optimized. OMG! I don’t know how many times I thought about this. But I never done anything about it. Until now. My husband always leaves the toothbrush on the sink. it’s disgusting. I like that it doesn’t require any drilling as well. That’s always scary in the bathroom. Is it possible to get different designs on it? This is a fantastic product, I would love to have one. The toothbrush sanitizer holder, doesn’t just help me keep my toothbrush in place, it also ensures that they are also germ free. I think this brand is really budget friendly, and it’s worth having in every household. With a one-year warranty, I know I’m fully covered in aspect of malfunctions. Hello there! I was just in the process of looking for a review on these kinds of toothbrush holders and boy did I find one. Your review is very in-depth here. I’m please to find you. Up until now we have always put our manual toothbrushes in a cup by the side of the sink. But this is right next to the toilet and I know that’s not the most hygienic thing to do. When I first started looking around at these I did see the ones that you are talking about with the toothpaste dispenser. But we are a large family and we have 3 types of toothpaste by the side of the sink! So a dispenser wouldn’t really be any use to me anyway. Going on what you have said about this one, I think this is the one for me. I use an Oral B electric brush and so does my wife. But we also have a couple of family members who use manual brushes. But it looks to me like they would all fit ok. Is it really necessary for the door to close fully? Anyway, looks like this is the one for me. Thanks for providing a link to purchase it! thanks for stopping by and taking the time to read the whole review. Electric toothbrushes will fit in the unit but as you said the door will not be able to close but that’s fine. The UV rays will still project onto the bristles to kill off the bacteria. I think this is one the best UV sanitizer for toothbrush in the market today. Studies published in several dental journals do indicate that UV sanitizers are effective at killing microorganisms and bacteria, I hopefully hope this can reduce a smelly toothbrush too. I’m impressed by how stylish it looks and the design. It’s definitely a piece to own. 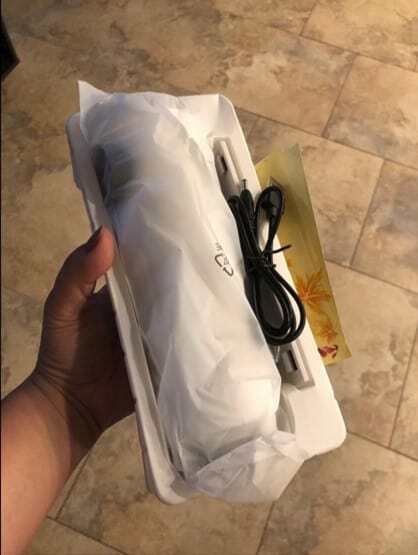 Thank you for sharing your post on sanitizer holder for UV toothbrush. I have been wanting to look into getting a UV toothbrush so I found your review on Samocare UV Holder very informative. It’s interesting how the UV kills the bacteria with light. 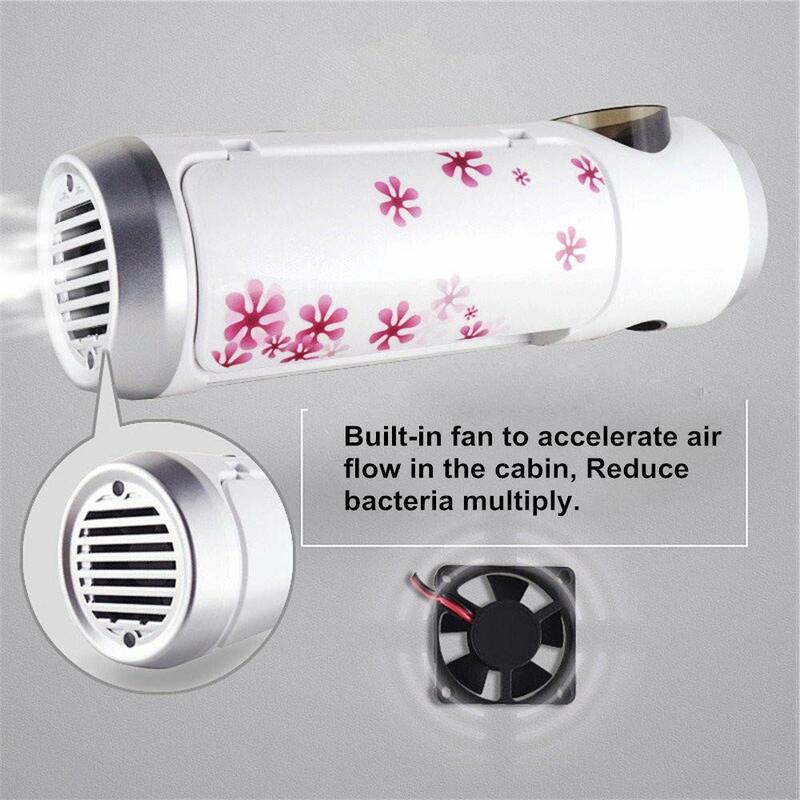 I like the exclusive fan for blowing away moisture. Also, like having room for more than one brush to sanitize. This toothbrush sanitizer is perfect for our family of 4, with extra for a guest. 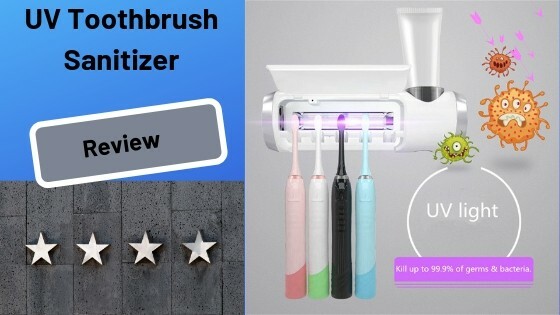 Hi, I appreciate this detailed review of UV Toothbrush sanitizer Holder, it so happens that I landed on your website while searching for the best toothbrush sanitizer, and your review has helped me make a wise decision. I know it’s not healthy to leave toothbrush on the counter, so I had a container, but as I suspected and you have confirmed, bacteria can find their way to the toothbrush and since you said the counter could have more bacteria than a toilet rime, (that scared me) it means we could be putting our health at risk. So I think this UV toothbrush sanitizer will save me from worries about germs and bad bacteria. I don’t know about this product before I see your post. In daily life, after brushing my teeth every day, we put the toothbrush on the counter. Most people may not realize the bacteria are going to attach on to the bristles fast if they don’t have the professional knowledge . so thank you let me konow this, I have decided to buy your recommended Sarmocare UV Toothbrush Holder online after reading your post. I am a germophobic and always concerned about germs in the bathroom and my toothbrush in particular. I’ve thought about getting a toothbrush sanitizer for quite some time now and after reading this, it’s time now. It just makes sense to have a sanitizer to kill off the bacteria we don’t need in our mouths. This certainly sounds like it does the job and is very affordable. Does this come with a warrantee? yes it comes with 1 year’s warranty. The installation is very simple. All you need is some strong tape (provided with the product) to attach the unit onto the wall. Takes around 5 minutes. I heard about a UV Toothbrush Sanitizer Holder from one of my friends. But then I was not so interested. Read the review and find out more about the product today. In fact, we neglected the proper maintenance of toothbrush. But it’s important just like taking dental care. Anyway, I liked the blessings of technology. It doesn’t have to drill walls to fitting, and the warranty offer is interesting as well. Warm thanks to the author for this valuable review with a nice video clip.